Herbert, only months after his successful Finals in Oxford, was staying with his friend ‘Cherry’ Newbolt at the beginning of August 1914. He was playing a game of bowls with Cherry’s father, Sir Henry Newbolt (the Newbolt of “But the voice of a schoolboy rallies the ranks/ ‘Play up! play up! and play the game!’). Sir Henry was called to the telephone. When he came back to the lawn, he remarked, conversationally, “Germany has declared war on France” and then called to Herbert “Your turn, I think” (Pound, 37). On 5 September 1914, Herbert went down to Lambeth Pier and enlisted as an ordinary seaman in the Royal Naval Volunteer Reserve. He wanted to avoid the accusation that, as an Oxford toff, he would immediately take a commission and “be all right” (Pound, 40); he also thought that he might have a chance to meet up with his brother Sidney, who was training as a submarine officer. I am one of the too-fortunate survivors of that lost generation of 1914, who suffered our Schools [Oxford Finals] in June of that year, and heard our fate in July. For a week or two of that brilliant summer we strutted the world, boasting about our degrees or explaining them away, and in either case considering ourselves lords of life—and then in August, or maybe September, discovered ourselves, with some astonishment, recruits or combatants in a war that was to save civilisation and be the last war of all. Yes, though we were thrilled by the bugles and the drums, and though we delighted in our flags and uniforms, we did believe that (quoted Pound, 40). Herbert went to Oxford in the autumn, in the uniform of an Able Seaman, to take the written examination for the All Souls Prize Fellowship: he did it as a joke, it seems, for all his answers were written in the light verse for which he was already renowned. He married on New Years’ Eve 1914, to a woman called Gwendolyn Harriet Quilter: “In World War One her initials G.H.Q [General Head-Quarters] on the railway luggage rack would attract respectful attention” (A.P.H., 19). Three months later he became a sub-lieutenant in the Royal Naval Volunteer Reserve, and was posted to Hawke Battalion in camp at Blandford in Dorset: together with Rupert Brooke, and the sons of the Prime Minister and of Lord Rothermere. Herbert and his battalion arrived in the Bay of Mudros, off Gallipoli, on 17 May 1915. He was in charge of a platoon of Tynesiders whom he could not understand, and two men from a remote Durham mining village whom not even the Tynesiders could understand. Hay-fever was an extra misery on the Gallipoli Peninsula in War One. On either side of the communication trenches the poppy and the cornflower flourished, and I used to sneeze all the way to the frontline and back. I was Battalion Scout Officer. One night the Staff desired some particular piece of reconnaissance in No Man’s Land, and I was detailed. I was a fool, I suppose, and afterwards I blamed myself severely. I should have said: “I’m sorry, I have hay-fever.” But how would this have been received by the Staff, by my Colonel? To the rest of the world hay-fever is a joke. So, on a quiet night, with two of my scouts I crawled forth. All went well of some way. There were no flowers in No Man’s Land, but suddenly I sneezed: the Turks opened rapid fire, and one of my scouts was hit. He was hit in the femoral artery. I remember terribly how the other scout and I dragged the poor fellow back through the hole in the wire into the front trench. He died later. I ceased to be Scout Officer: and hay-fever is no joke to me (A.P.H., 3). 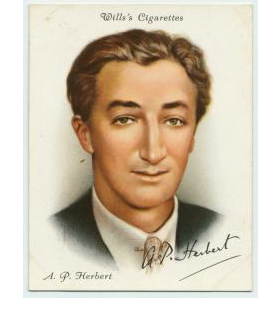 It was the only event from 1914-1918 that Herbert remembered or wanted to write about when he came to write A.P.H., at the age of almost 80. Otherwise, little is known of his time at Gallipoli: except that he did meet his brother Sidney” “I took him up to the front line (in his whites, provoking the Turkish snipers)” (quoted Pound 46). On 30 July Herbert developed a high temperature, and he was invalided home with violent enteritis. Later that summer Herbert rejoined Hawke Battalion; but they were at Abbeville in France by then. He found that they were being treated almost as if they were Army, rather than Naval Division. There was a row about the wearing of beards, for instance. Herbert became assistant-adjutant of the Battalion, in charge of the battalion’s correspondence, which he conducted “from this vantage point of mingled authority and irresponsibility” (quoted Pound 52). In July 1916 the Royal Naval Division moved into the front line, near Vimy Ridge. In November it attacked at Beaucourt: 20 officers and 415 other ranks attacked; fewer than 20 mustered after the attack, and Herbert was one of the two officers who were still standing. After this attack a sub-lieutenant in Nelson Battalion was court-martialled and executed for cowardice: quite possibly the event that triggered Herbert’s The Secret Battle. Bu 1917, the Naval Division had been integrated into the Army as the 63rd (RN) Division. On 23 April, Shakespeare’s Day, in 1917 Hawke Battalion attacked Gaverelle, west of Arras, and Herbert was wounded. Jagged bits of shrapnel and hip-flask were embedded in his left buttock; he credited the brandy from the hip flask as having sterilised the wound. Herbert was sent home to recover. While he was convalescing he wrote The Secret Battle, the powerful story of a soldier’s nervous breakdown at Gallipoli, and his subsequent execution for cowardice. It was published in 1919, and received great acclaim. Field Marshal Lord Montgomery called it “the best story of front-line war I have read”, and Winston Churchill wrote a reverent introduction to the 1971 edition. It began Herbert’s writing career, but also began his career as a campaigner for legal reform; it was credited with influencing improvements in the court-martial procedures. On 2 October 1918 he sailed out of Liverpool bound for Alexandria: his job as “assistant to Commodore”. They reached Port Said, and then sailed westward along the North African coast. Although when in Gallipoli he was excited by the fact that he was near the Plain of Troy, the sights of North Africa seem to left him rather cold. Algiers was “rather like a clean edition of Hastings” (Pound 59). He was in Algeria, visiting Tlemcen, when he heard the news of the Armistice. From there he came to Gibraltar, and took the train north to Seville and Madrid, and thence home. I am relying on Reginald Pound’s A.P. Herbert: A Biography (London: Michael Joseph, 1976), supplemented by A.P.H. : His Life and Times, as by Sir Alan Herbert, C.H. (London: Heinemann, 1970).